The GeForce® GTX 1080 Ti is the world’s fastest gaming GPU. 3584 NVIDIA® CUDA® cores and a massive 11 GB frame buffer deliver 35% faster performance than the GeForce® GTX 1080. 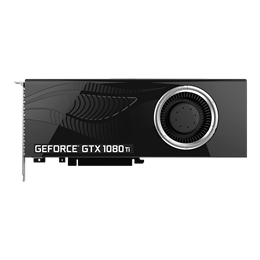 GeForce® GTX 10-Series graphics cards are powered by Pascal to deliver up to 3X the performance of previous-generation graphics cards, plus breakthrough gaming technologies and VR experiences. Unprecedented gaming horsepower. Exceptional craftsmanship. A 7-phase dualFET power supply. All cooled by a radial fan with an advanced vapor chamber designed to for consistent performance in even the most thermally challenging environments. This is the forward-thinking innovation that makes the GeForce® GTX 1080 Ti the Ultimate GeForce. PNY stands behind our products, our GeForce® GTX 1080 Ti Blower Edition graphics cards are backed by a 3-Year warranty. Our US-based technical support team is available 24/7 to answer your questions.